Somewhere, in space, this could all be happening right now. 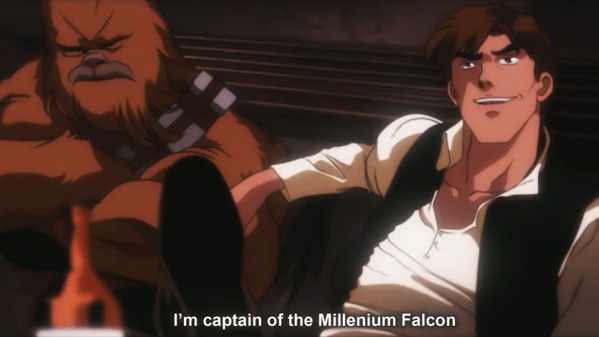 Check out this new fan-made trailer for Star Wars: A New Hope, remade into a Japanese anime. It's awesome. Really, the animation work in this is fantastic, and I'd seriously pay god money watch this movie if they actually made it. Every once in a while, someone will re-imagine live-action movies as anime (or in the style of Pixar) and it's almost always cool to see. We're in the midst of a new era of Star Wars movies, but it's also nice to go back to the original movie that started it all. The anime characters here are pretty much spot on, and I wish this could really be turned into a feature-length film (why not just watch the original film, right?). Anyway, see the anime trailer below. Luke Skywalker joins forces with a Jedi Knight, a cocky pilot, a Wookiee and two droids to save the galaxy from the Empire's world-destroying battle station, while also attempting to rescue Princess Leia from the evil Darth Vader. Original description from YouTube: "Fan-made anime trailer for A New Hope. Art & animation by Dmitry Grozov aka Ahriman" - follow his YouTube channel to see more. Star Wars: Episode IV - A New Hope was written and directed by George Lucas, and first released in May of 1977. There have been many animated versions of Star Wars over the years. Currently: Star Wars Rebels, Forces of Destiny, The Clone Wars, and Star Wars Resistance airing next month. Always cool to see stuff like this. Thoughts?